Jewelry can be one of those little joys in your life and if you can create your very own and it look store bought, even better. 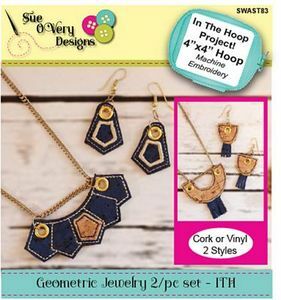 This collection has two completely different geometric shaped sets. The first set has an art deco feel to it with angled shapes and contrasting stitching. The necklace has (5) angled sections with the center offering a spot for applique. The matching earrings offer a single of the same shape with an absence of material with a satin stitching inside shape. These are made entirely in the hoop, ITH, using an embroidery machine. The second set has a U shape primary with cut fringe emerging from the base. Fringe used shown is Cork edge painted with gold fabric paint. Use cork on the front and back for a polished professional finished jewelry set. Once stitching and cutting are complete, finish the raw edge with some fabric paint and add jewelry hardware. Both sets require (4) 5/8in rivets, (2) fishhook findings and (4) large spring rings. Art Deco set measures: necklace charm 2-3/4in w x 1-1/4in tall and earrings 3/4in w x 1-1/4in tall U-shaped set measures: necklace charm 2in x 2in (including the length of fringe) and 1in w x 1-1/2in tall (including the length of fringe). Perfect Cork scrap buster. Requires 3in square for front and 3" square for back for each set.